I’ve just learned that its Ag Day 2013 which has inspired me to get back to blogging. I’m sorry for the long lag! Being a North Dakotan who was raised rural, I often forget that others don’t have a familiarity with the beauty of agriculture and the enormity of farm production. I’m from the Red River Valley, an area known for its fertile farm lands. To me, there’s nothing more beautiful than miles of plush, green fields, for as far as the eye can see. Visitors to North Dakota frequently call the Tourism Division and ask about the types of crops they’re seeing in the state. Whether its fields of blooming purple flowers (flax), small yellow flowers (canola) or those photogenic sunflowers, we love to help our visitors learn more about the scenery they’ll find here. Agriculture is North Dakota’s #1 industry. According to research at North Dakota State University, it contributed $7.8 billion to the state’s economy in 2011. And North Dakota leads the nation in production of sunflowers, barley, dry edible beans, pinto beans, canola, flaxseed, honey, lentils, dry edible peas, durum wheat and spring wheat. So I’m sharing a bit about North Dakota’s agriculture today and there are three tourism-related spins that I want to put on this #1 industry: 1) how to enjoy the beauty; 2) how to enjoy the production; and 3) how to learn more and experience agriculture. Knee high by the 4th of July? 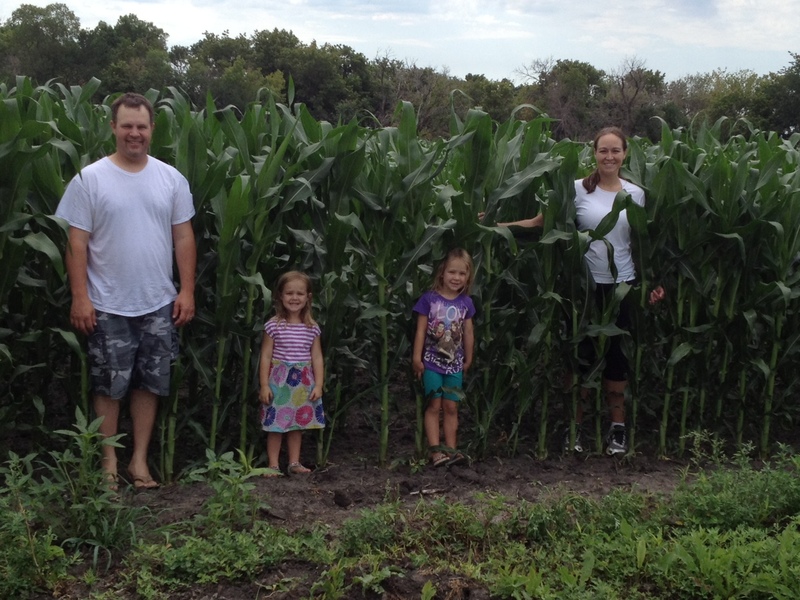 This is my family, in the Red River Valley, late June, 2012. Agriculture, including ranching, is everywhere in North Dakota, covering approximately 39.2 million acres. Any spring, summer or fall trip through the state and you’re guaranteed to see the land in some phase of production. Most spring planting occurs in April and May, with harvest spanning a wide time frame, depending on the crop. 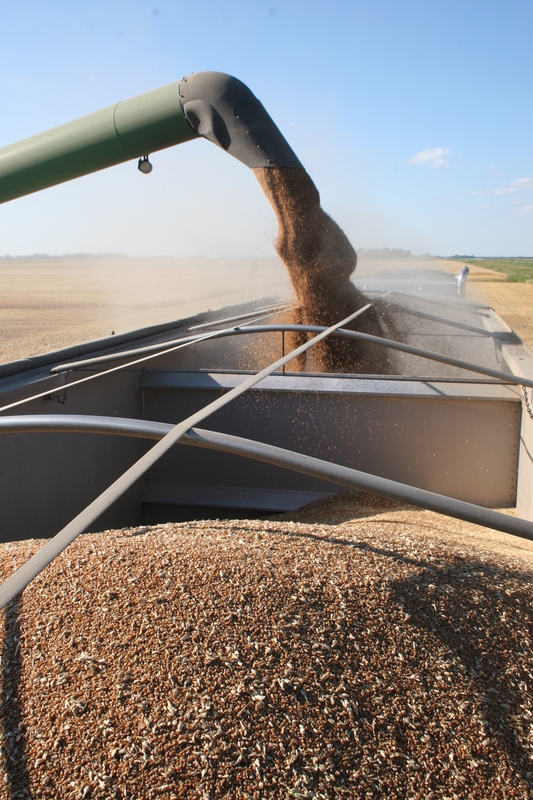 Harvest takes place anywhere between July and November. Visitors can journey throughout North Dakota and also make stops at specific farms and gardens, such as Dakota Sun Gardens near Carrington and Black Leg Ranch near Bismarck – where you can even saddle up for your tour. Photo opportunities are plentiful! THIS is where agriculture gets yummy! Consider for a moment the Red Barn and Berry Farm near Kindred. Here you can pick raspberries and even nibble as you go – without fear of being weighed on your way out! Farmer’s Markets can be found in cities large-and-small, like the Town Square Farmers Market in Grand Forks – taking place Saturdays mid-June through September. And check out the North Dakota products marketed by Pride of Dakota! You’ll find everything from delicious Dakota Growers Pasta to lotions made of honey. Agriculture in North Dakota has history. Visitors can relive farming on the prairie at Bonanzaville in West Fargo or experience what a northern “plantation” was like at the Bagg Bonanza Farm near Mooreton. And if ranching is more your interest, there’s no better place than the North Dakota Cowboy Hall of Fame in Medora. Not just a hall of honorees! This museum celebrates western heritage and culture. Interested in the scientific side of agriculture? Visit the Langdon Research Extension Center or the North Central Research Extension Center of Minot and see how tests are being done to maintain and improve the industry. If you really want to get your hands dirty, North Dakota has opportunities for that too! GardenDwellers Farm of Esmond has classes, events and “group play” in production of herbs. Sheer sheep and spin your own wool at Wooly Girls, near Wales. Get your feet dirty at the Red Trail Vineyard Harvest Festival and Grape Stomp. Okay … I’m going to throw in a fourth way to enjoy agriculture in North Dakota and that’s in celebration. Here you can find festivals for rhubarb, chokecherries, apples, sauerkraut, lefse, ribs, turkeys, watermelon, sunflowers, corn, potatoes and even lobster. 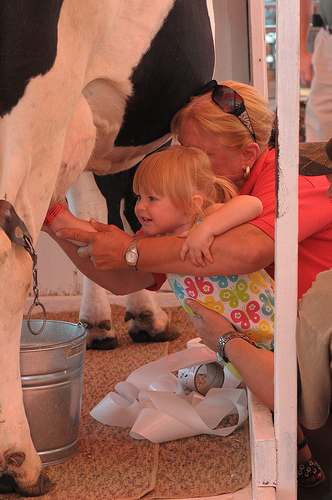 The North Dakota State Fair has competitive exhibiting (and great entertainment). There’s also a huge annual event called the Big Iron Farm Show that draws more than 80,000 people. Agriculture and tourism blend together brilliantly in North Dakota. In fact, we have an AgriTourism program helping connect travelers to all these ways to experience the industry and helping producers expand their businesses by offering tourism components. Learn more online. Happy New Year! What are your vacation resolutions? This is the time of year that’s full of vows for self improvement. I admit that I’m doing it. And if you’re making resolutions too here’s one to add to the list: Resolve to use your vacation time this year on actual vacations. In 2011, about 57% of working Americans had unused vacation time at the end of the year and most of them left an average of 11 days unused. (CNN Money) But research is showing that if you want to stay healthy – take a vacation! 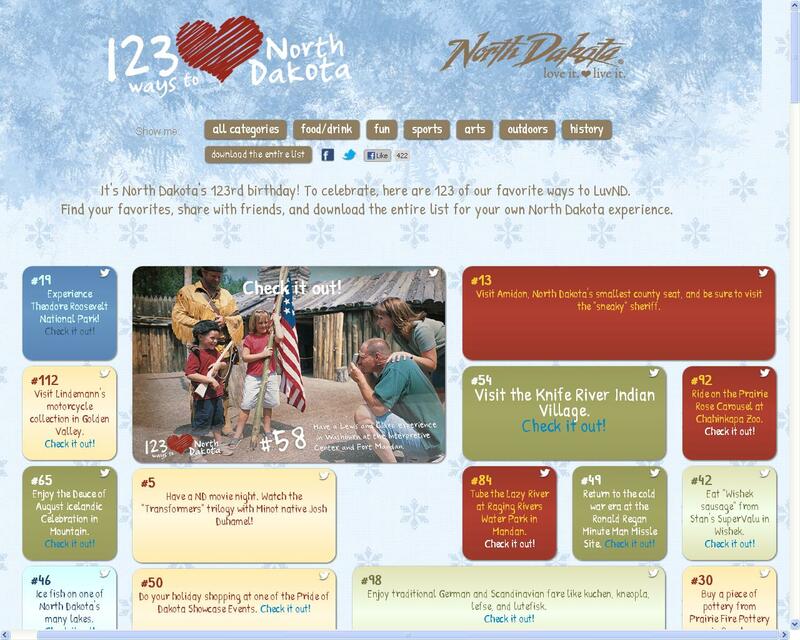 Last November, the North Dakota Ambassador program launched a lighthearted “bucket list” of fun things to see and do in North Dakota – it’s called “123 Ways to Luv ND“. This list was inspired by people, places, activities and accolades that North Dakotans love about the state. I personally think it’s also a fun way to inspire visiting North Dakota! Here you can get a taste of a few submitted favorites with the opportunity to learn more. Run events at the Fargo Marathon and Bismarck Marathon. And maybe the Uff Da Mud Run in Grand Forks! In high school, I was a tour guide at the Bagg Bonanza Farm near Mooreton and I really want to bring the family for the first time and see how much the more this National Historic Site has been preserved. Stay at Woodland’s Resort and fish Devils Lake. So … what’s on your vacation-resolution list for 2013?!? Grand Forks is having their annual Rollin’ on the River event August 24-25! The weekend kicks off on Friday with a Keep the Ball Rollin’ Golf Tournament at King’s Walk Golf Course and Rockin’ Rollin’ Rally & Feast in Lincoln Drive Park at 5 p.m. On Saturday, the Rollin’ on the River inline skating marathon takes place on the city streets of Grand Forks, with the Alerus Center as the starting point at 7:30 a.m. You can also enjoy an evening of great blues music in the heart of beautiful downtown Grand Forks at the Blues on the Red Music Fest event. Top musicians from around the country will provide the free entertainment, while vendors sell such delicious cuisine. Check out central North Dakota and see all the fun things going on. In Minot, the North Dakota State Fairgrounds play host to Motor Magic, Labor Day weekend in Minot. The largest motorsports event in the Upper Midwest, Motor Magic provides entertainment for auto enthusiasts of all ages. Nodak Speedway races and drag racing on the Magic City International Dragway kick off the motor mayhem. Motor Magic continues with more to see and do Saturday, Sunday and Monday. If you want to head to the Bismarck-Mandan area, Mandan is hosting its annual Wild West Grillfest! Celebrate Mandan’s farming and ranching heritage with a grilling competition, beer gardens, a variety of live entertainment all day, inflatable games, hayrides, art and craft vendor booths, Pride of Dakota tent and dance Friday night on August 17-18. There will be live music by The Roosters on Friday and Dirty Word on Saturday. Or you can head west to Medora to see all the funs things they have to offer. The Medora Musical is a great show that goes through September 8. Stop in for a great meal at the Pitchfork Steak Fondue or maybe play a round of golf on the world renowned Bully Pulpit. Maybe you just want to do a little hiking; well Theodore Roosevelt National Park is a great place to explore with the whole family or as private getaway! For more events and attractions, go to the North Dakota Tourism website. Who knows what kind of adventure is out there for you! We made a reservation at the Medora campground and had a site near the Little Missouri River with a view of the buttes of Theodore Roosevelt National Park. Here we made a little lunch (there is a partial burn ban in place) before heading into the town of Medora for some shopping. A pair of cowboy boots and a cap-gun later we were in swimsuits and heading to the City pool. At just $3.00 per person for the day this heated pool was a great place to be on a 90-degree day. From the pool we also ventured to the new Family Fun Center. $8.00 per person equals two-days of unlimited use of the inflatable water slide, rock climbing wall and bungee-jump-trampoline. I lost track of the number of items we went down the slide. My daughters are 4 and 5 1/2 and they had no problems making the stairs and no fears heading down the slide. But I will say that my children have a bit of fearlessness in them. Case in point, the rock climbing wall. The website doesn’t say exactly how tall this wall is but in my perspective as their mom – my daughter was hanging 1,900 feet off the ground. The staff were friendly and thorough and safety was never a question for me. Both girls said that their favorite activity though was the trampoline bungee-jump. And what can I say about the Medora Musical?! It is one of the best shows I’ve seen performed at the stunning Burning Hills Amphitheater. The new cast had perfect harmonies, the music was a great blend of modern country, gospel, patriotism and classic themes, the script was fresh and the fiddler is awesome. Camping was a success. There was a rain shower that went through and yes, it was a little warm and stuffy. Plus, the sunrise was at 5:30 a.m. and I think my daughters were up shortly after that! But nothing can compare to seeing them wake in that golden light and look out on the Badlands with such joy. Sunday morning we took a drive through the South Unit of Theodore Roosevelt National Park where we were very soon greeted by buffalo who had taken over a prairie dog town. Just another mile into the park, more buffalo greeted us – including a pair who walked right along our pickup. We took a hike along the Wind Canyon Trail – which was great for the ages of my daughters. It has a great view of the Little Missouri. And finally, off into the distance, we saw a herd of wild horses that made my youngest daughter smile like this. If you have favorite vacation stories and pictures, please share them with us on our Facebook page! This guest blog comes from our friends at El Monte RV Rentals who invite others to explore North Dakota as they did. Here’s a great way to produce an eyebrow-arching reaction from your friends: tell them that you’re going to take a trip to North Dakota this year. That’s right, North Dakota – home state of bubbly bandleader Lawrence Welk, zen coaching great Phil Jackson and peppery actress Angie Dickinson, to name just a few famous North Dakotans. Those who think the only thing to do in North Dakota is shovel snow 10 months out of the year would be very surprised to find out just how much fun you can have in our 39th state. And because so many still think this way, you’re not going to find the usual suffocating crowds and long lines that plague so many of the country’s top destinations. So pack your bags, rent an RV and get ready for a memorable and truly relaxing vacation. Begin your trip in the eastern part of the state with a stop at the Prairie Rose Carousel in Wahpeton, open Memorial Day through Labor Day. Even people without kids will marvel at seeing this fully restored 1926 Spillman model featuring 20 intricately painted wooden horses, two chariots and a calliope – it’s one of only 150 working carousels left in the country. And should you fancy a ride, it’s just $1.50. From there, it’s a short drive to Bonanzaville in West Fargo. Learn about prairie life in the 1800’s as you stroll through more than 40 restored vintage buildings, including homes, schools, stores, depots and banks. On-site museum collections feature tractors, buggies, medical equipment and aircraft, including a C-47 that was used during the D-Day invasion. To see an amazing collection of vintage aircraft that still fly, check out the nearby Fargo Air Museum, which features the F4-U Corsair, L 39 Jet, TBM Avenger, P 51 Mustang, Fairchild PT-19A, L 19 Bird dog, Bell Helicopter and “Duggy – the Smile in the Sky” DC 3. Next, drive north to Dunseith to visit the International Peace Garden located on the US-Canadian border. Constructed in 1932 as a symbol of friendship between the two countries, the 2339-acre Peace Garden offers vibrant displays of over 150,000 flowers including an 18-foot floral clock. It’s open year-round but the best views are when the park is at full bloom mid-July through August. Take time to park at one of the campgrounds to hike the surrounding Turtle Mountain forests and do some serious bird watching. Also worth a stop is nearby Lake Metigoshe State Park, where you can enjoy acres of pristine wilderness, a crisp mountain lake and hike the 3-mile Old Oak Trail, the state’s first Recreation Trail. Here you can experience the rugged beauty of nature while you unplug from life’s day-to-day distractions. After a day or two of true R&R, you’ll be ready to head back south to Bismarck, the state capital and home to a number of can’t miss historical attractions. The North Dakota Heritage Center museum is open year-round, and documents the entire history of the land from its formation and pre-historic dinosaurs to the western expansion era, Indian encounters and industrial age growth. You can also learn about the U.S.S. North Dakota and other nautical interests in the Hall of Honors section of the Museum. Famed explorers Lewis and Clark travelled the Missouri River (which is actually longer than the Mississippi) through this part of North Dakota with Indian guide Sakakawea, and their adventures are highlighted at the Lewis and Clark Interpretive Center next to Fort Mandan, just a short drive from Bismarck. You can try on a buffalo robe, learn about the fur trade and view breathtaking watercolors by Karl Bodmer, regarded as one of the best eyewitness illustrators of Upper Midwest Indian Cultures. In addition to Fort Mandan, Fort Abraham Lincoln State Park located on the west side of the Missouri boasts an impressive array of historical attractions, including reconstructed Indian earth lodges and General George Custer’s last Calvary post and reconstructed home. It was from this fort that he rode out to meet his fate at the hands of Sioux and Cheyenne warriors. The western part of North Dakota is where you’ll find Theodore Roosevelt National Park, a panoramic tribute to our 26th President’s fervent belief in conservation, located near the town of Medora. You can read about the former president’s adventures in his own words and explore his Maltese Cross and Elkhorn ranches, surrounded by the austere beauty of the western badlands. Gain a unique perspective of the area from a saddle –guided horseback tours are available at Peaceful Valley Ranch within the Park. Wrap up your tour by taking in a performance of the Medora Musical – a rollicking family-friendly entertainment adventure with singing, dancing and even live horses in a show that reflects upon the time Roosevelt spent in the area. The show is performed nightly during the summer months, and includes a mix of modern country, gospel and patriotic songs. Amusing, restful, historic and panoramic – all very suitable words you can use to describe your journey through the quietly remarkable state of North Dakota. Joe Laing is the Marketing Director for El Monte RV Rentals. You can see more great RV vacation ideas in their Monty’s Musings RV Travel Blog and be sure to check out their Camping Pictures. It’s May 17. One-hundred-thirty-six years ago this day Lt. Col. George Armstrong Custer and the 7th Cavalry based at Fort Abraham Lincoln in the Dakota Territory left their post and journeyed west on the Centennial Campaign into the valley of the Little Big Horn. It was an attempt to force non-treaty Indians back to their respective reservations. Outnumbered, outgunned and outmaneuvered, over 260 men were killed during the ensuing battle, including all five of Custer’s companies. The Custer story is legendary in North Dakota – shared with visitors at Fort Abraham Lincoln State Park south of Mandan and along the Custer Trail Auto Tour through the Little Missouri Grasslands near Medora. May 17th also marks the 25th anniversary of the groundbreaking for Custer House – the reconstructed home of George and Libby Custer. Visitors to Fort Abraham Lincoln can tour Custer House and the rebuilt cavalry post commissary, barracks and outbuildings. They can hear the stories of how the first fort – Fort McKeen – was created to protect railway expansion. By 1874, then known as Fort Abraham Lincoln, it had become the largest and most important fort in the Dakota Territory and was the starting point of Black Hills Expansion to confirm rumors of gold. Daily tours are available at Fort Lincoln and at On-A-Slant Indian Village – another “don’t miss” attraction of Fort Abraham Lincoln State Park. On-A-Slant was a large village of the Mandan people dating to around 1575. It suffered greatly from a smallpox epidemic in 1781. Visitors today are guided by interpreters as they tour reconstructed earthlodges and hear stories of the Mandan people.